The multidisciplinary and multimedia project H.U.M.A.N.W.O.R.L.D (Holistic and Utopian Multinational Alliance for New World Order and Research in Living and Dying) was initiated at the beginning of the 1990s. It develops a reflection on multiculturalism and globalization through the representation of the Other. 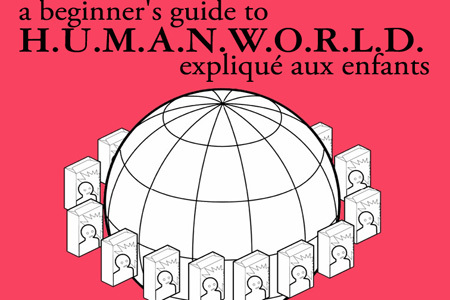 The work H.U.M.A.N.W.O.R.L.D is a website available online and adapted from the book “A Beginner’s Guide to H.U.M.A.N.W.O.R.L.D: expliqué aux enfants” [“A Beginner’s Guide to H.U.M.A.N.W.O.R.L.D: explained to children”]. It takes on all the concepts and productions from the project in a visual and interactive form. The H.U.M.A.N.W.O.R.L.D project depends on an almost museological collection of “product-portraits” collected throughout the world. The packaging of these products has the particularity of bearing one or more human faces chosen to represent them, raising the question of the place and status of individual identity at the heart of the globally established order, namely through stereotypes. As a website H.U.M.A.N.W.O.R.L.D figures a city map where the different neighborhoods allow access to seven chapters containing numerous levels of evolution, each linked with the idea of community. 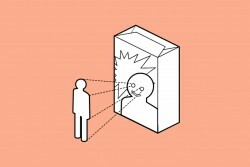 Each chapter leads to an interactive gallery where a slide show is connected with a construction in a place with a well-defined role: a billboard for the chapter “The Gallery of Portraits,” where portraits of packaging come to life and take on human form to become avatars in a “super-community,” in opposition to the chapter on “sub-community,” represented by a rotating statue among apartment buildings and made of the real people who posed for “product-portraits”; a cemetery for the chapter “Becoming” shows portraits made by experts, simulating the aging of the models. Through this project, Guillaume Paris gives life, voice and future back to the fixed portraits on packaging and thus explores the philosophical notion of reification and de-reification. Guillaume Paris (1966-) is a French plastic artist. He studied engineering, plastic arts and anthropology and today teaches in many art schools throughout the world. Thanks to his numerous travels and his childhood, spent between many continents, the artist developed a certain sensitivity to different cultures. His work revolves around the way they are often represented from the perspective of their exploitation, examining human values and their manipulations in a critical manner.